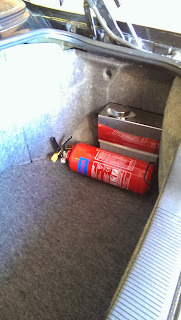 As per my previous post, speculating and test fitting the windscreen washer bottle in the boot. I have now gone ahead, wired it and plumbed it in. In my particular case I wanted to investigate alternate ways of supplying the front screen washer (a legal requirement in the UK) and also the rear screen (as I like everything to work). This is due to the planned installation of a different inlet plenum which would mean an alternative would be required. Off the shelf there are a few options, plastic smaller bottles, fabricated metal cans and washer bags. These are all very well and good but only come with one outlet, so no good to me. In fact the best washer bottle seemed to be the very one I had fitted from the factory, anything else being a 'cheap' but strangely expensive alternative. Thinking about the problem it seemed clear that I could utilise the already plumbed in rear washer pipe and use this to feed the front washers. There is also a reasonable amount of wasted space in the boot of the car behind the wheel arch, so I could tuck the washer bottle away in its new position. As per my previous posting, for mounting, I purchased a small sheet of MDF board, made myself a paper template around the inside of the spare wheel cover with an extension over the empty wheel arch area. 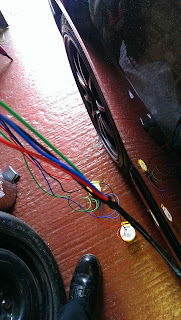 Took a little bit of fiddling around to get the board to sit flat due to the joint sealer that Nissan slap into place. A couple of strong double sided automotive sticky tape holds everything in place nicely. Well that is a scant description of the mounting, am sure there are any number of ways and ideas for doing that bit. The main 'meat' has to be actually doing the re-plumbing! 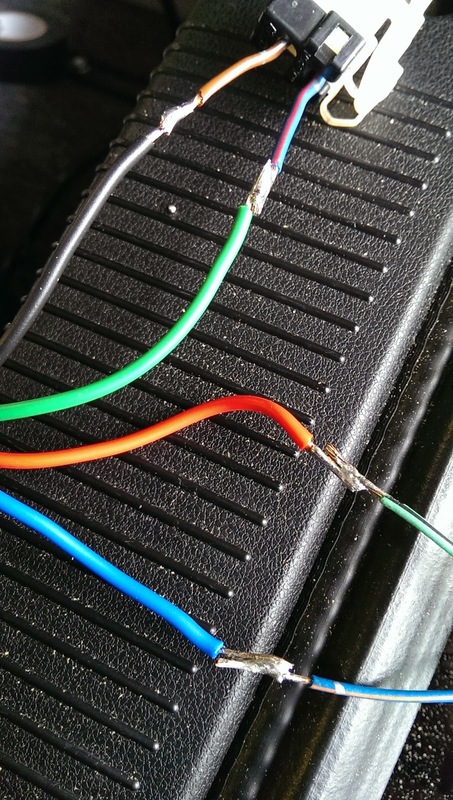 First or all consider the wiring. The pump connectors have four wires, two on each one. These are both 12 volt, so will both need taking back to the relocated pump. 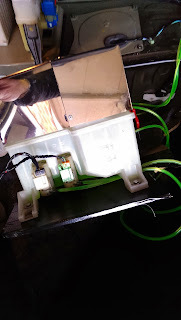 For me the best way of doing this was to cut the connectors and wire back to the pumps. It's not as terrible as it sounds, basically the main loom exits the engine bay behind the radiator expansion tank, you will have to remove the drivers side front wheel and upper inner wheel arch cover, where all will become clear. Once the cover is off you will also see the washer bottle pipe work. 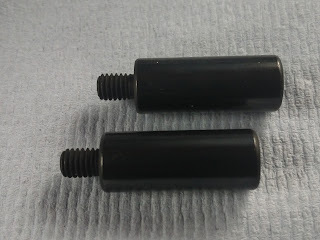 The front washer bottle pipe is black, whereas the rear is a clear pipe. 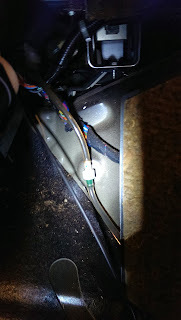 I found the best way to feed wires was to make a small hole in the large wiring rubber grommet, feed a single wire through to the drivers compartment and then attach all the wires to this, pulling them through the inner wing. 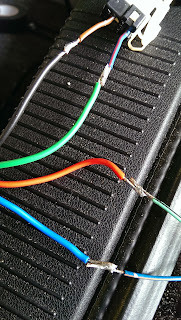 Remember that it's quite a long run for the wiring and would be a drag to be feeding from the other direction! Remember you will need a fair amount of cable and should tape it up. To run the wires along the interior of the car is quite simple, remove the foot well trim, the side step cover, the rear seats. The carpet lifts easily and has a couple of plastic hooks holding it to the car. As to the washer plastic pipes. I purchased a couple of lengths of 4mm pipe and two straight pipe connectors. The rear washer has a non return feed valve joiner behind the rear seat, disconnect the pipe here and connect a length of new pipe, feed this through the rear bulkhead (this will now be your front washer pipe. The other now disconnected section goes to the rear washer, connect your in-line connector here with your other length of new pipe, this will be your rear washer pipe. 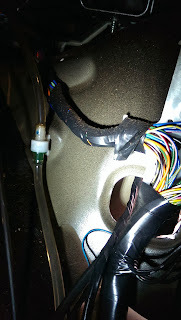 The other in-line connector I used at the front of the car to connect the old clear rear pipe to the front black pipe going to the front washers. There would have been enough clear pipe to actually do this without connecting it this way, although I preferred the look of a black pipe (vanity!). All wired up? Be sure to test before final fitting of all seats etc. That is the main 'meat' of the job. There are no real pitfalls or terrible mountains to overcome. You just have to plod your way through it.